Of those considering changes to their commute since tolls began along Interstate 66, carpooling or slugging was the fourth most popular option, according to a WTOP survey of Northern Virginia commuters. WASHINGTON — Many Northern Virginia commuters are considering changes to their trek to work since tolls began along Interstate 66 last month. But carpooling and slugging are not among the most popular options. According to an online, nonscientific survey of commuters, carpooling and slugging ranked as the fourth most popular alternative to paying the tolls. The survey of 1,030 commuters was conducted from Dec. 14 to Dec. 18. The tolls kicked in on Dec. 4. Taking another route, leaving earlier and other options — such as moving or finding a new job — were the most popular alternatives. Leaving later, riding Metro or taking a commuter bus rounded out the bottom, according to the survey. About half of commuters said that after a week of tolls and extended HOV restrictions, they were rethinking how they commute. State officials have said the goal of the tolls and extended HOV hours is not just to move traffic faster but to encourage drivers to carpool or choose public transit. “We’re hopeful that this project can start to move more people through this corridor,” said Nick Donohue, deputy secretary of transportation for Virginia. But so far, commuters have been unwilling, or unable, to leave their cars behind. One reason, commuters suggested, was that slugging — a form of casual carpooling common among Interstate 95 and 395 commuters — never evolved along I-66. Three weeks and counting and commuter Kristen Koines of Oakton said she is successfully slugged along I-66 just once. She has joined a Facebook group for I-66 sluggers; she has gone out of her way to stop at the Vienna Metro station to try to find a carpool. She has exchanged messages with other commuters. But no luck. “It’s not quite simple. I have been unable to find anybody,” she said. Amid the Christmas holiday and her later, 9 a.m. departure time, slugging options were slim during the first few weeks of tolling. But Koines plans to try for a few more weeks. If she doesn’t have any success, she will leave for work earlier to navigate side roads like U.S. 29 to her job near Farragut West. She said that one laminated sign is posted at the Vienna Metro stop — specifically at the kiss-and-ride lot on the south side of the station — notifying slugs where they can wait to find a driver. Kalai Kandasamy, creator of the SlugLines app, said the sign is there to help match drivers with riders heading to Foggy Bottom. He hopes to eventually add pickups locations in Herndon, Stringfellow Road and the Fairfax County Government Center. Transportation officials recognize that they are building a slugging culture from scratch along the interstate, Donohue said. “We simply don’t have the infrastructure,” he said. Both park-and-ride lots and bus service, to serve as a fail-safe for sluggers, are needed to make slugging a viable alternative, Donohue said. The good news, he said, is that the state plans to build more park-and-ride lots outside of the Capital Beltway and to direct millions toward new bus service. An estimated $15 million from toll revenue will be available to pay for such transit improvements and to help encourage carpooling along the corridor, Donohue said. Two new express bus routes are already up and running — one from the Fairfax County Government Center and another from Gainesville — with the help of an initial $10 million from the state, said Kate Mattice, executive director of the Northern Virginia Transportation Commission. 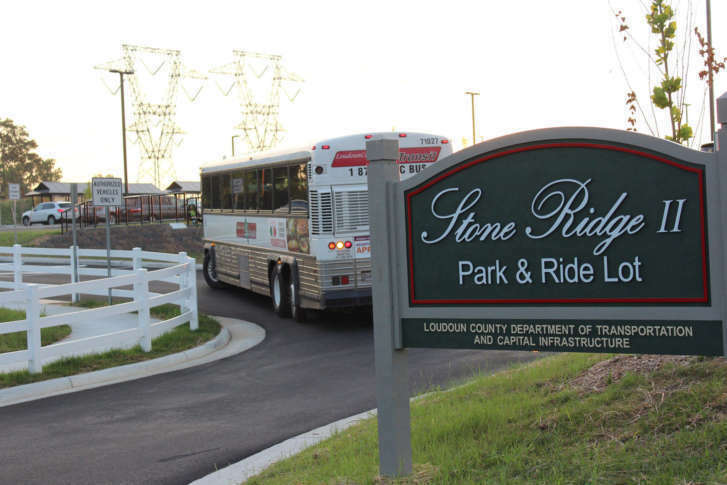 A new park-and-ride lot gives Loudoun County commuters new options, including slugging. And three more projects are about to roll out — including more express bus service in Arlington County, she said. Although the commission’s programs don’t focus specifically on slugging, they aim to give commuters incentives to try carpooling or vanpooling or to help link commuters to Metro stations, Mattice said. And the demand is high — local governments requested more than four times the money available in 2017, she said. “I think that demonstrates the need and the desire to be funding more transit and more transportation alternatives along that corridor,” Mattice said. Still, those planned projects don’t help Christine Simmon with her commute from Wolf Trap through Tysons Corner. The hybrid driver, who traveled I-66 legally under the old HOV restrictions, said she looked into slugging, but nothing has emerged north of the interstate. $3.3 million — Fairfax Connector service from Government Center to D.C.
$1.9 million — Stone Ridge park-and-ride, 2 years of bus service to D.C.
WTOP’s Neal Augenstein contributed to this report.